The New York Media Festival is back again and better than ever, ready to offer everyday folks an exclusive behind-the-scenes look at NYC’s top tech firms. The three-day event, held October 6–9th, will bring together more than 1,000 leaders in digital media, games, music, television, and more. Our partners at CityRealty are on the amazing list of participants, and as part of the Tech Crawl event—which will also take ticket-holders into the workspaces of iHeart Radio, Conde Nast Entertainment, DOTS and many, many others—they’re hosting “Boozy History of New York City,” featuring drinks from local breweries and distilleries accompanied by facts, figures and history on the neighborhoods from which they hail—all to make for an educational and enlightening evening through the lens of real estate tech, architecture, and, well, booze. We’ve teamed up with CityRealty and New York Media Festival to give one lucky 6sqft reader two V.I.P. all-access passes to the festival (WORTH $2,200), which includes all the fun going down at CityRealty on Wednesday, October 7th. 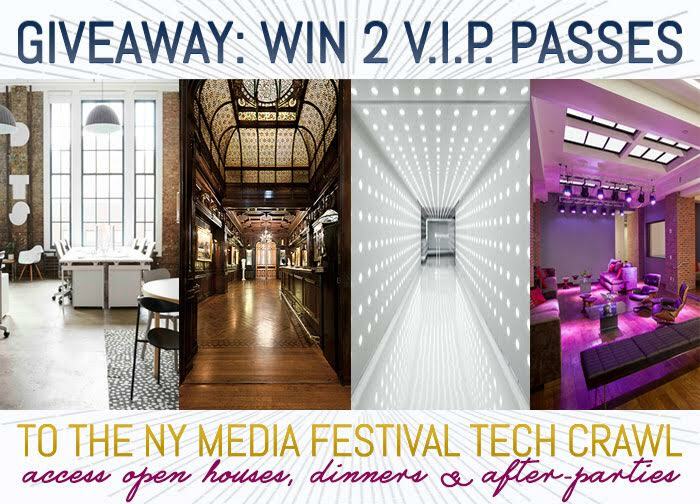 And that’s it—you’re entered to win an all-access pass to the New York Media Festival! The deadline to enter is Wednesday, September 30th. Please note that the event at CityRealty will be held on Wednesday, October 7th. The conference takes place over three days from October 6-9th. If you can’t wait to find out if you’ve won, grab your tickets to the festival then RSVP to CityRealty’s event. Buying a ticket to the festival grants you access to the Innovation Expo and OpenSpace Sessions, and Showcase events.